I just had a fantastic day with the Arizona Technology Education Association conference on the campus of Arizona State University. It was the third and last of their three conference series, but I’m looking forward to hooking back up with the AZ folks at the reception at NECC in July. One treat was making the connection between the Shawn Wheeler who was to pick me up at the Phoenix airport last night and the Shawn Wheeler who contributed to Freedman’s Coming of Age book. 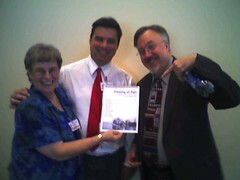 Here’s a picture of Shawn and me and ASU professor, Peggy Davis. At the moment, I’m in the Phoenix airport, enjoying free WiFi. I love it when this happens, and it was nice to do a little research in preparation for my Discovery Educator Network workshop tomorrow at SeaWorld. Cool!